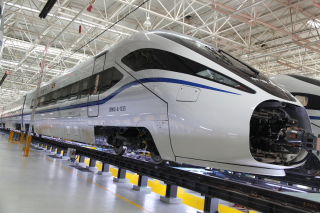 Travel PR News | Bombardier Sifang (Qingdao) Transportation Ltd. to supply 144 new generation high speed train cars for China Railway Corp.
Bombardier Sifang (Qingdao) Transportation Ltd. to supply 144 new generation high speed train cars for China Railway Corp.
BERLIN, Germany, 2017-Mar-03 — /Travel PR News/ — Rail technology leader Bombardier Transportation announced today that its Chinese joint venture, Bombardier Sifang (Qingdao) Transportation Ltd. (BST), has been awarded a contract with China Railway Corp. (CRC) to supply 144 CRH1A-A new generation high speed train cars for China’s evolving high speed rail network. The new cars will enter service with the Chengdu and Kunming Railway Bureau and support the continued development of Western China’s new ‘Diamond Economic Circle’, which includes the cities of Chengdu, Chongqing, Xi’an, Guiyang and Kunming. The contract for 18 eight-car trainsets is valued at approximately 1.95 billion Chinese RMBs (268 million euro, $ 284 million US). Bombardier owns 50% of the shares in BST, and the JV is controlled by BT’s partner CRRC Sifang Co., Ltd.
With an operational speed of 250km/h, the CRH1A-A train’s aluminium carbody design reduces weight and track wear as well as aerodynamic drag, delivering improved performance and operating costs. The train’s graphics, unique windows, lighting and shape give it a distinctive appearance, while its exceptional energy efficiency sets new industry standards for sustainable transportation and passenger comfort. The trainsets also feature the highly efficient BOMBARDIER MITRAC propulsion and control system, supplied by a separate Bombardier Chinese joint venture, Bombardier CPC Propulsion System Co., Ltd. (BCP). Bombardier Transportation in China is the full solution provider across the entire value chain. From vehicles and propulsion to services and design, Bombardier Transportation in China has six joint ventures, seven wholly foreign-owned enterprises, and more than 6,000 employees. Together, the joint ventures have delivered more than 3,500 high speed railway passenger cars, 560 electric locomotives and over 2,000 metro cars to China’s growing urban mass transit markets. Bombardier also provides propulsion equipment to third party metro car builders for use in 21 Chinese cities. As a proven global full services provider, Bombardier’s joint ventures have also won orders in China to provide maintenance for 1,160 metro cars. This entry was posted in Business, Trains, Transportation, Travel, Travel Management, Travel Tech and tagged Bombardier Sifang (Qingdao) Transportation Ltd., Bombardier Transportation, China Railway Corp., high speed train cars, Jianwei Zhang. Bookmark the permalink.